I’m from a cooking school of thought very closely aligned with that of Rachel Flax (Winona Ryder’s mother in the movie, Mermaids, memorably played by Cher) who believed in making hors d’oeuvres and only hors d’oeuvres. If left to my own devices, every meal would be a string of snacks and finger food. But when I hear my cooking-centric friends rhapsodize over the amazing meals they concoct with ingredients I’ve never heard of, I wonder if I’m missing out. 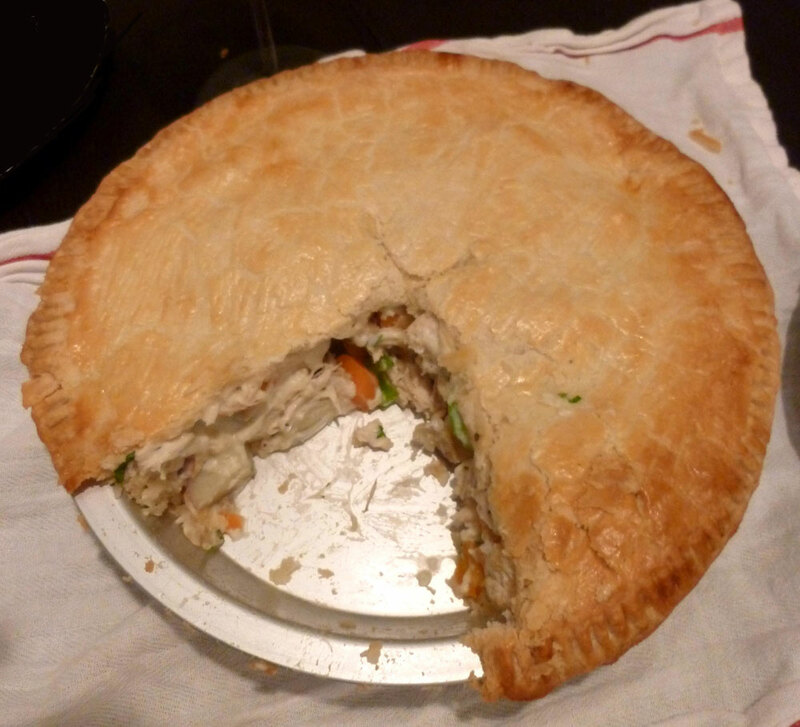 So having only made a few basic dishes before (rice and beans), or been relegated to the “peeler and chopper” when assisting in the kitchen, I thought I’d try my hand at the Chicken Potpie recipe from Thomas Keller’s Ad Hoc at Home cookbook. The cookbook’s recipes are described as “doable at home,” so that seemed like a step in the right direction. Right off the bat I was relieved to note I had definitely heard of all the ingredients needed for the potpie, and as a bonus, I already possessed a few (milk, butter and carrots!). And those I didn’t have in my kitchen wouldn’t go to waste if there were leftovers (pearl onions and bay leaves). After reading the recipe, it seemed pretty straightforward, even to my untrained eye. The only step I was really sweating was making the pie crust, which has always seemed particularly scary – Don’t overwork the dough! Make sure everything stays cold! It can’t be too dry! Or sticky! I always thought it was a task best left to the professionals. So after rereading the recipe about 6 times, I jumped in, and turns out, no, it isn’t that scary. The one oversight on my part was forgetting that I don’t actually own a rolling pin, which I imagine would be immensely helpful when trying to roll out dough. Turns out a wine bottle can pinch-hit if needed. Once I had the dough situation under control, the rest was smooth-sailing, I chopped and simmered the vegetables, cooked up some béchamel sauce (perhaps whisking a little too obsessively, but there were no lumps!) and finally assembled the pie and popped it in the oven. The result? A dish I couldn’t believe I had created, and the first dish I felt the need to photograph – partly because I was so proud and partly because I knew no one would believe it came from my oven. But most importantly, it was delicious. Flaky crust? Check. Creamy, savory filling? Check. Tender vegetables? Absolutely. Roll out the dough (see below recipe), place one piece in a 9- or 10-in. pie plate and the second on a baking sheet, and refrigerate. Put the potatoes, carrots, and onions in separate small saucepans with water to cover and add 1 bay leaf, 1 thyme sprig, and 8 peppercorns to each pan. Bring to a simmer until just tender, 8 to 10 minutes. Bring a large pot of salted water to a boil. Fill a medium bowl with ice water. Blanch the celery until just tender-crisp, 1 to 1 1/2 minutes. Drain, transfer to the ice bath, and chill until just cold. Drain and add to the baking sheet with the other vegetables. Melt the butter in a medium saucepan over medium heat. Whisk in the flour and cook for 2 to 3 minutes; adjust the heat as needed so that the mixture does not brown. Whisk in the milk, lower the heat to keep the béchamel at a gentle simmer (use a diffuser, such as a Flame Tamer, if necessary), and cook, whisking often, until the sauce has thickened and reduced to about 2 cups, 30 to 40 minutes; move the whisk over the bottom and into the corners of the pan to be sure the béchamel doesn’t burn. Position the oven racks in the lower third and center of the oven and preheat the oven to 375˚F. 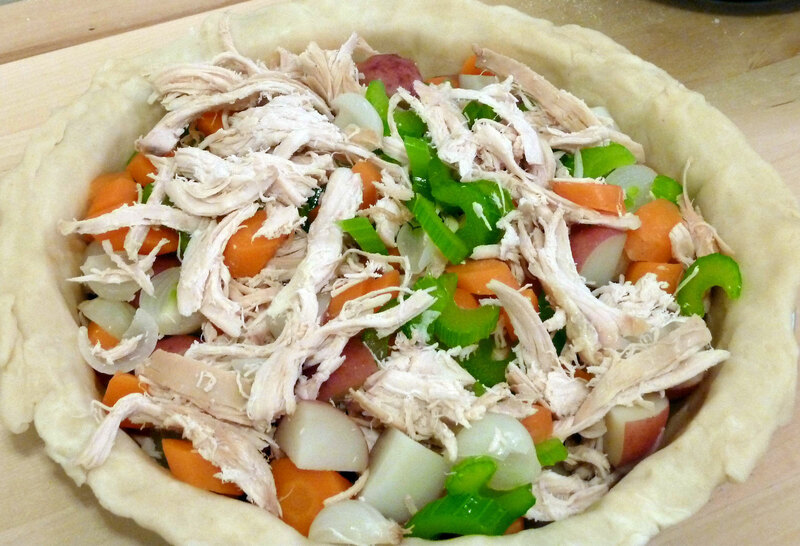 Scatter the vegetables and chicken into the pie shell. Pour the béchamel over them. At this point, if the top crust is too hard to shape, let it rest at room temperature for a few minutes. Moisten the rim of the pie shell with some of the beaten egg. Cover the filling with the top crust and press the edges of the dough together to seal. Trim away the excess dough that overhangs the rim. Brush the top crust with the egg. Cut a small vent in the center of the dough with a small cutter or the tip of a paring knife to allow steam to escape. Cut the potpie into 6 wedges and serve warm. The secret to a great pie is a great dough that bakes into a flaky, crispy crust. It’s not difficult—the key is to avoid overworking the dough. I prefer mixing the dough by hand, but you can use a mixer if you like. As I mentioned earlier, I believe that feeling comfortable making a pie dough is one of those essential skills any cook should have, and it’s another technique that gives you versatility in the kitchen. When you know how to make a good pie dough, you can use it for Chicken Potpie, Cherry Pie, a blueberry pie, a lemon tart, or a tarte tatin. Combine the flour and salt in a large bowl, then add the butter and toss to coat with flour. With your hands or a pastry blender, work the butter into the flour, tossing and incorporating any pieces of butter that have settled at the bottom of the bowl, until the butter pieces are no larger than a pea. Drizzle 1/4 cup of the water over the top and, using a fork, mix the dough until it just holds together when pinched; add the remaining tablespoon of water if the dough is very dry. Knead the dough until it is completely smooth and the butter is incorporated. Divide the dough in half, with one piece slightly larger then the other (the larger piece will be for the bottom crust). Shape each half into a 1-inch-thick disk, wrap tightly in plastic wrap, and refrigerate for at least 1 hour, or for up to a day. (If the dough does not rest, it will shrink as it bakes). If the dough is too hard to roll, let it rest at room temperature for a few minutes or pound it a few times with a rolling pin. Lightly flour the work surface and a rolling pin. Lightly dust the top of the larger disk of dough with flour and roll it out to a 13- to 14-inch round, about 1/8 inch thick: roll outward from the center, rotating the dough frequently and adding a little flour to the work surface or dough as needed to prevent sticking. Fold the dough in half and transfer to a 9- to 10-inch pie plate, gently easing the dough into the corners and up the sides. Roll out the second piece of dough in the same manner, to a 12-inch round, about 1/8-inch thick. Place on a parchment-lined baking sheet. Refrigerate both doughs for 15 minutes. I have been exploring for a bit for any high quality articles or blog posts on this kind of area . Exploring in Yahoo I at last stumbled upon this website. Reading this info So i’m happy to convey that I have an incredibly good uncanny feeling I discovered exactly what I needed. I most certainly will make sure to do not forget this site and give it a look regularly.